​Show - Richard and Darlin made it back to the finals! Finishing 5th in the Open Two Rein Division. ​Thank you Linda Mars for trusting me with such an amazing horse. 2014 and 2015 were great years for Richard and Bugs Bunny. (Mr. Chibs)) Championships at the Hackamore Classic and the NRCHA Derby were icing on the cake for the Hackamore stage of Chibs Vaquero tradition training. He was a great athlete with a super start from Richard's son-in-law, Chris Dawson. 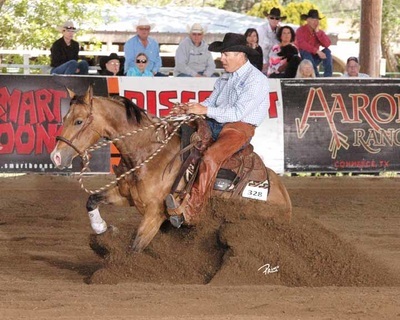 He is currently being shown as a Bridle Horse by a competitive Non-Pro in Texas. Are You and your horse prepared? 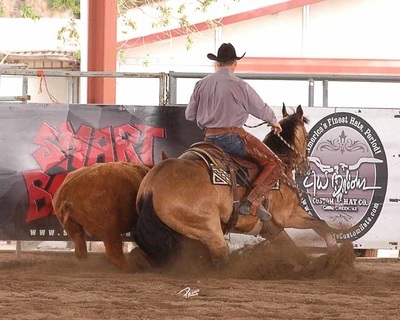 We've just returned from Santa Ynez, California, where Richard competed in the third annual Super Cow Horse Competition. 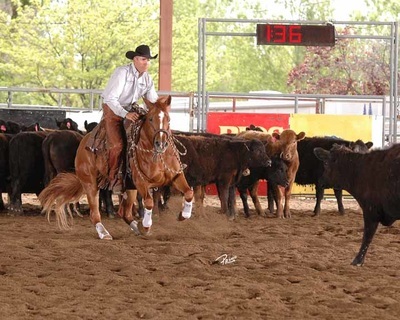 This event requires that a horse and rider compete in cutting, reining, going down the fence, penning, roping, cowboy pleasure, and trail classes. When the dust settled and the scores were tabulated Richard won a respectable fourth place on our own horse Hip Adams. He also rode Shiney De Mayo, a Reined Cow Horse that he has had in training for the last two years, owned by our good friends John and Sandy Mastromonaco. Richard and Shiney had a consistent set of scores throughout the weekend and were crowned champions of the Super Cow Horse 2009! Richard was featured in the September issue of the Western Horseman Magazine. Please be sure a pick up a copy! 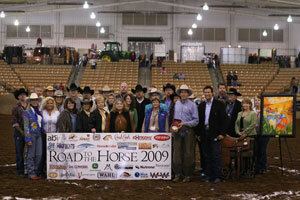 This one-of-a-kind event, known as Road to the Horse, is the brain child of Steve and Tootie Bland. Previous Champions of this prestigious event are: Clinton Anderson, Stacy Westfall, and Chris Cox. It was a privilege and honor for me to have been invited to participate as a 2009 contestant. My fellow competitors were “Americas Most Trusted Trainer” -- John Lyons and past RTTH competitor and RFD-TV personality -- Tommy Garland. John, Tommy, and I got back on our own personal horses and rode into the flag filled arena to await the announcement; “And the winner of Road to the Horse 2009 is…Richard Winters!” The fireworks went off and the Cowgirl Chicks took off at a full gallop and I fell in right behind them. 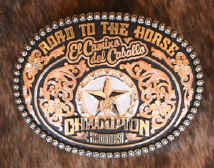 I have been in numerous competitions and have known the thrill of victory and the agony of defeat but being proclaimed Champion of Road to the Horse 2009 is a win that I’ll never forget! The award ceremony was like Christmas in March! 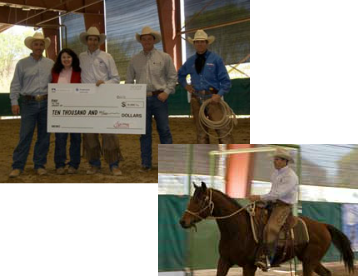 Receiving a check for $10,000 from Road to the Horse producer Tootie Bland, a memorial Steven “Dookie” Bland trophy saddle provided by Martin Saddlery featuring conchos by Gist Silversmith, and an original painting by artist Peter Grant entitled “On the Road” which was featured as the cover image of the event’s souvenir program, a logo embossed CSI saddle pad, and a beautiful Gist Silversmith’s Masters Collection gold buckle made this win very exciting. Ford Dodge stepped up to the plate and sponsored a $15,000 check to the charity of the winner’s choice. My wife, Cheryl, and I are honored to have Focus on the Family receive this generous donation. I believe that being invited to participate in RTTH automatically makes you a winner! Each competitor received a standing ovation for his accomplishments and the crowd was very appreciative of everyone’s efforts. I want to take a moment to thank “Team Winters” for all of their help during the weekend. I also want to thank Tootie Bland and each of the Road to the Horse volunteers for orchestrating this one of a kind world class event. 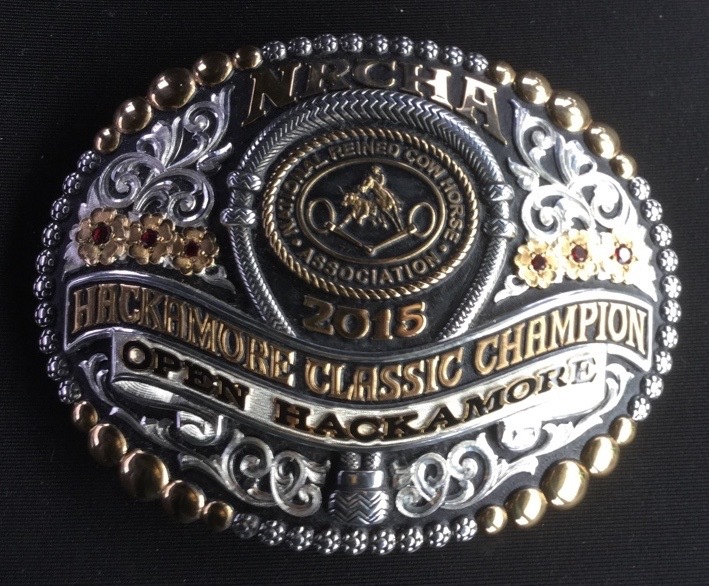 I was honored to be invited and it was a privilege to ride with two great horsemen and you bet I was thrilled to win! 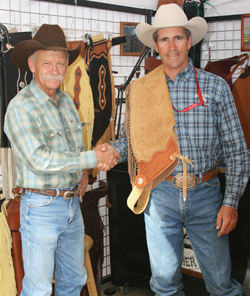 You can contact Dave Thornbury for your next pair of custom chaps at www.thornburychaps.com. The "2008 Shoot Out" in Temecula, California, sponsored by the SCNRCA proved to be a profitable show! Richard secured a spot in the "Open Division" competition and went on to enjoy another successful win on “Hip Addams” our 5 year old hackamore show horse. We are proud to display our Ted Robinson signature saddle in our trophy room! 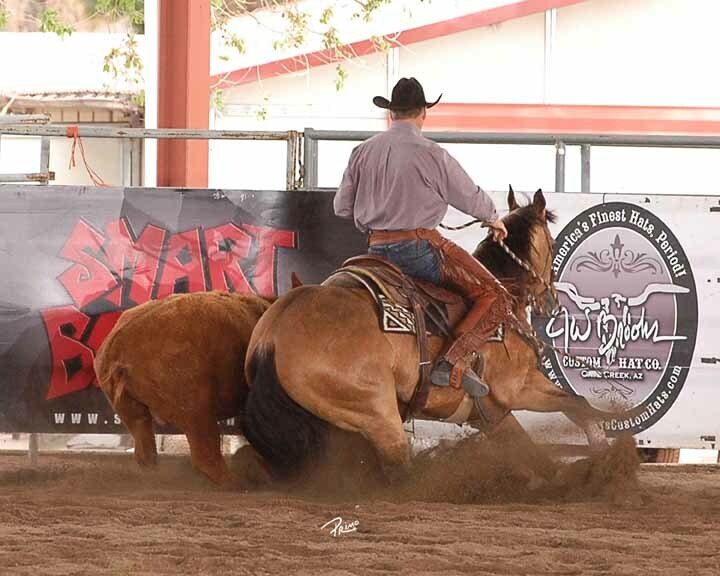 Todd Lambert, one of our Non-Pro clients also took home a new saddle by winning the "Non-Pro Limited" division on his horse "Gunna Be Crazy" the same day! Richard and Sarah Winters - Bring Home Championships! The trip home from Temecula was quite pleasant in light of the fact that we brought home not one but two Reined Cow Horse Championships! 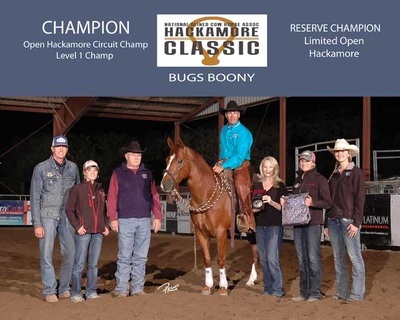 Our daughter, Sarah, won the Limited Open Bridle Spectacular and Richard was able to climb to the number one spot for the Open Hackamore Championship. 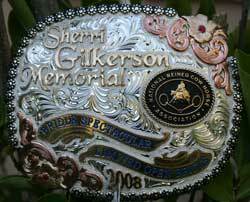 2008 is the second year for the annual "Sherri Gilkerson Memorial Spectacular Horse Show." She passed away three years ago in a tragic horse related accident. 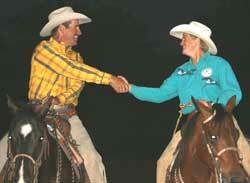 Sherri was a great horsewoman and fierce competitor in the NRCHA. 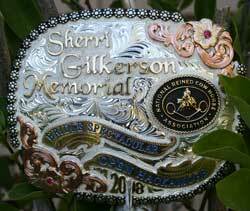 This has become a great show and both Sarah and Richard are honored to be able to wear and display these beautiful memorial buckles! We also had the privilege of conducting Cowboy Church again this year. A special thanks goes out to Mark Gilkerson (Sherri's widower ) and Jim Paul for the fantastic mandolin and guitar accompaniment! Sarah had an awesome fence run on Gunna Be Crazy. There was no catching up to her after that! 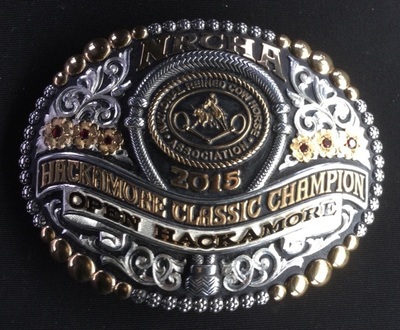 Things came together in just the right way, allowing Richard to win the Open Hackamore Spectacular. This was a special treat for Richard as he was able to take the lead over many of his hero's and mentors in the Reined Cow Horse World. What a great weekend this was for the Winters! 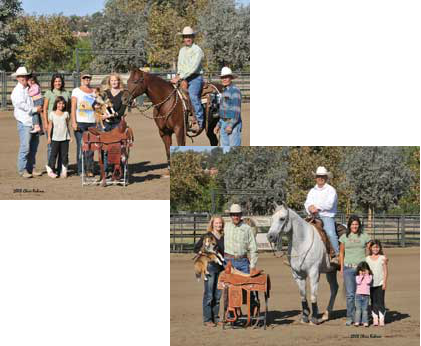 Richard was honored to receive the 2007 - "Monty Roberts Western Equitarian Award"
Given by Monty & Pat Roberts in Solvang, California, this award is dedicated to the the person who has worked with the horse's mind without using force and in Honor of the Trainers of Western Horses. Past recipients of this award have been Greg Ward, Crawford Hall, Sheila Varian, Tom Marvel, Bobby Ingersoll, John Ward, Al Dunning, Craig Cameron, and Chris Cox. When asked if Richard would receive the honor, for 2007, he was only pleased to be placed in the same category as the above mentioned horsemen and women! Along with daily Horsemanship Demonstrations and Cowboy Church, Richard Winters was invited to compete with some of the nations most popular horsemen for prizes and prestige. Agreeing to take on the challenge placed Richard in the arena along side Craig Cameron and Ken McNabb who dazzled the audience with an "Extreme Equine Experience." Each contestant drew for their own 3 year old un-started colt. They then introduced; ground work, saddling, riding, trotting, and loping to their colts. This contest culminated with negotiating an obstacle course during the end of the second day's 90 minute session. It was a close contest and each contestant did an outstanding job, using his own tried and true techniques. 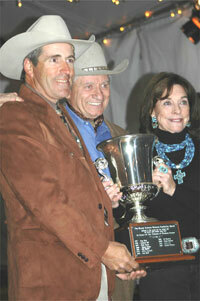 When the dust settled and the scores were tabulated, the five judge panel voted Richard Winters the 2007 Champion! A 1st place purse of $10,000. made the late night trip back to The Thacher School in Ojai, California, seem much shorter! Here's what Richard had to say about his win, "It was an honor for me to be starting colts along side two really good hands, such as Craig and Ken. They both did a great job with their colts and I believe the judging was really close. My family and I thank God that things turned out the way they did!" A special thanks goes to CenCal Mortgage, Inc. and Prudential Hallmark Realty for sponsoring the competition as well as John and Maureen Rudnick, the event owners and coordinators, for the opportunity to have been a part of such a great "Equine Experience!"